No digging in your archives – photo must be made in August 2018! Deadline is August 31st, 2018. Members only! You’ll receive an email with the Dropbox File Request. civil twilight is our “blue hour” – it last for about 30 minutes, after sunset. It’s getting darker but there’s still plenty of light in the sky, especially to the west of course. Only the brightest stars are beginning to appear. There’s a beautiful and very even light on the landscape. nautical twilight lasts for about 30 minutes after civil twilight. There’s still some light in the sky, a beautiful period to make night photos, plenty of stars are visible already in the dark sky, features in the landscape are still visible to the camera without light painting. astronomical twilight lasts for another 30 minutes, after nautical twilight. It’s pretty dark now and essentially night for us. Foreground features in the landscape will mostly disappear, unless the moon is up or you manually light paint them. Your shutter will be open for a bit – a sturdy tripod with a good head is a must! Do not underestimate how bright the moon is! Keep it out of your frame, it will just be a featureless white blob in the sky. You can use the moonlight though: with a long enough exposure time, a landscape under moonlight can appear almost as bright as day. Reaching for the stars? Maybe you want them to appear as dots and not as streaks! BE SAFE! Don’t go alone into the dark. Bring a buddy, a headlamp and spare batteries! Feel free to ask any questions in our Facebook group: San Diego Photo Club. And now: have fun, and good (star) light! 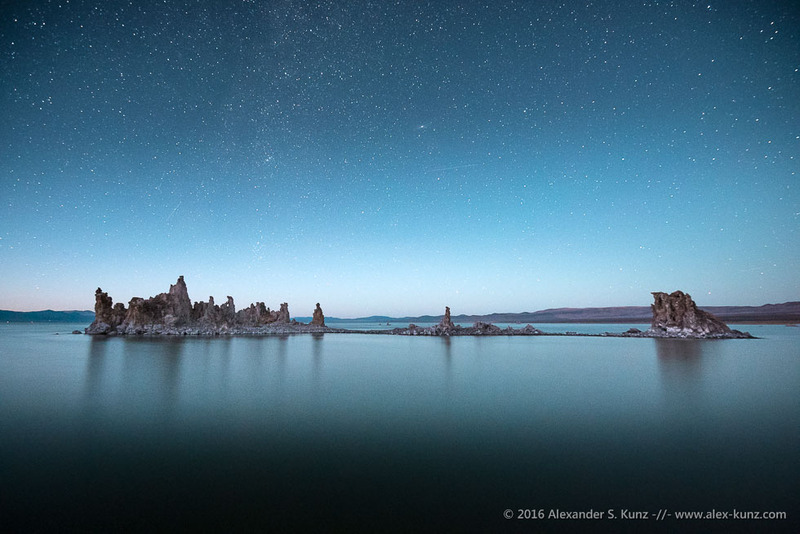 Shipwreck Tufa under stars, South Tufa, Mono Lake, California, September 2016. Exposure info: 20 seconds at f/4, 17mm focal length, ISO 6400.